Alexandra Orlando is a PhD student at the University of Waterloo and Associate Commentaries editor at FPS. Her research interests include narrative theory and treating video games as literary texts. Betsy Brey is a doctoral student in English at University of Waterloo and associate essays editor for FPS. She researches game mechanics and narrative. Cameras in games can be easy to forget. It might even usually be the mark of a good camera mechanic if players don’t notice it at all. Player awareness of his or her guided perspective through a game is often only noted when it fails or inhibits play, but a game camera is often a silent narrator of the game experience. The camera and its operations are crucial to the navigation of digital spaces—perhaps the key component of digital gameplay (Manovich 244). However, most players will not consider gameplay as photographic, yet their entire experience is mediated through a camera, impacting the limitations and expectations of a game. As noted by Michael Nitsche in Video Game Spaces: Image, Play, and Structure, “it is in the nature of a camera (virtual or real) to select, frame, and interpret. Through this selection, the moving image infuses the virtual world with a perspective. It narrates the space” (77). Yet, until 1999, it was not used as a gameplay mechanic itself. 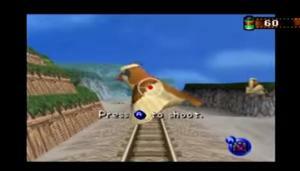 This silent narration was shifted entirely when Nintendo released Pokémon Snap for the Nintendo 64 console. Cindy Poremba, in discussing the role of the camera in digital spaces, points out that “in many games, the player’s role is hybrid: as camera avatar, players not only navigate through the game world, they film it as well” (49). The character has a point of view, but is essentially always being “filmed” for and by the player. This is a “‘gameness’ of photography” (Poremba 55) which is often forgotten in video games. Interestingly, the cameras that allow the player visibility into Snap most closely resemble games in the on-rails first-person shooter genre, such as the House of the Dead and the Time Crisis series in which a camera follows a set path and player interacts with objects within those predetermined frames within a pre-set time limit. Players in Snap are also asked to shoot, even if the shooting is done with a camera instead of a gun—perhaps making it one of the least violent first-person shooter games out there. It shares several mechanics and play-style elements with the goriest first-person shooters, where timing and accuracy are the main skill required for the games. However, just because the shooting is done with a camera and not a gun doesn’t make this kind of shooting any less weaponized. The purpose of the attack in the case of Snap is not to “shoot to kill,” as seen in most shoot-em-ups, but instead is to master and dominate: the same ultimate goal, but different methodologies. Drawing from the international popularity of the Pokémon series, Snap repositions gameplay from the role-playing mechanics of earlier games. Due to its in-game mechanics and integrative real-world mechanisms, Snap shifts the definitions of digital subjects and photographers, illustrating the complex relationship of subject and shooter in digital photographic practices. Ultimately, the practices portrayed in Snap prove to be deeply imbalanced experiences in terms of power dynamics, complicated by the popularity of the Pokémon series which encouraged players to “catch ‘em all.” These competitive practices extended beyond digital spaces with the intersections of print and digital photography and the gamification of photographic practices as taught and presented by the game. Games and photography already have much in common, even before Snap introduced explicitly gamified photography. Games are visual, but more importantly, games are models of experiences—not just depictions or descriptions (Bogost 4). The same can be said of photographs, which are also not representations of themselves, but instead, models of what they reveal. Barthes calls these “photographic referents,” stating that what the lens captures is different than what the lens was aimed at, both of which are different than the “real thing” intended to be put on film (76). The multiple layers of references, like in a game, reveal something entirely different than the actual—a model of a situation, moment, or person. However, viewers of photos and players of games often forget this difference. Barthes believes “a specific photograph, in effect, is never distinguished from its referent (from what it represents), or at least it is not immediately or generally distinguished from its referent” (5). Because photographs have a strange sense of authority, in which they capture the “real” in ways other media could not, the camera can be considered an extension of the eye. There is an organic sense to a camera, making it inherently connected to the biological. The camera is placed up against the eye which re-represents the subject in the photo. Even in Snap, the photographer avatar holds the camera up to his eye. 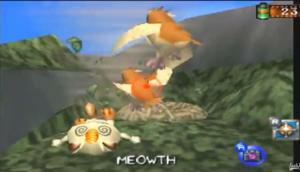 However, it is ultimately a representation of the biological through the dual manipulation of both the avatar’s camera and the game’s interface camera. This conflation of real and unreal, simulated and simulacra, biological and mechanical, complicates the “meta-realism” the game portrays (as discussed in Manovich 208). Such is the case with a game like Snap, where the practices of the game encourage players to model a specific kind of behavior and practices. In Snap, the impact the player has as he or she engages with the space portrays a lack of consequences. The game takes players into a representation of the “true” wild habitats of Pokémon, away from the towns and walking paths which make up of the map of the other games. While the player might temporarily impact a Pokémon or environment (for example, knocking a Pokémon into a lava pit, forcing it to evolve), any disruptions reset upon re-entering the level. Instead of walking through these environments, a small cart runs through different Pokémon’s habitable spaces, acting as nothing more than a guided tour car from which the player takes snapshots. The player remains stationary while “it is the virtual space as a whole that changes its position in each shot. Using contemporary vocabulary of computer graphics, we can say that this virtual space is rotated, scaled, and zoomed always to give the spectator the best viewpoint” (Manovich 108). 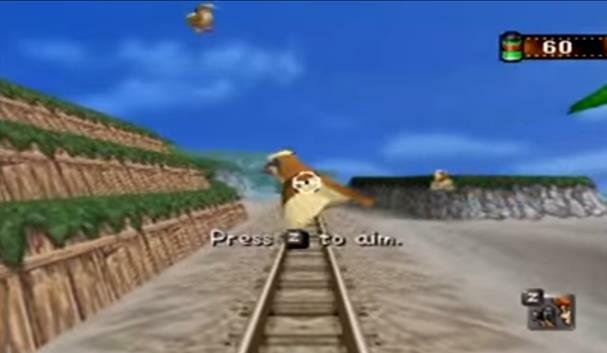 In the case of Snap, the on-rails experience guides the player through which shots to take based on curves in the track and visual cues such as glens in forests, signs and sounds. But the very presence of this rail system points towards unexpected implications. There are costs to “off the beaten path” wildlife photography in which the technologies (in Snap, the cart, including train tracks and teleporter gates) have been built directly in the middle of habitats. The disruption and reconfiguration of these spaces is done, in the words of the game, to “take pictures of Pokémon for the Pokémon Report” (Pokémon Snap), where the Report acts as visual evidence of Pokémon habits and ecosystems. Instructed to “try to take a lot of Pokémon pictures,” the player is challenged to seek out new kinds of creatures each trip (Pokémon Snap). However, this is always accomplished through additional disruptions to the habitat, as well as occasionally at the cost of harming the subjects of the photos. As Susan Sontag notes, “the view of reality as an exotic prize to be tracked down and captured by the diligent hunter-with-a-camera has informed photography from the beginning” (55). The digital world of the videogame is never in one single state. From the moment the player arrives on Pokémon Island, everything has already been reshaped. It is the goal of the player to manipulate this world in some form. Although Snap was one of the first games to utilize photography skills as the basis for this manipulation, it is one of the only ones to approach them as photographs and not in-game screenshots, even if that is what they ultimately are. However, Snap’s approach to collecting and mastering the space through photography is as equally contrived as other in-game photographic moments: Snap is simply the first game to offer it as the only means of mastery. The various methods of mastery these snapshots represent are both basic real-world photographic skills as well as skills that only function in the game space. Snap teaches players how to shoot the in-game film camera in a short tutorial (seen in its entirety below), and then leaves players on their own to manipulate the point-of-view camera to look and shoot at appropriate subjects—almost always Pokémon. However, these basic photographic skills, although certainly transferable, are not unique to Snap as a game or to photography. “Press A to shoot” could be from nearly any shooter game or point-and-shoot camera. Instead, the gamification of photographic techniques is performed through implementing a points-based feedback and critique system. Photographs determined as poor representations are awarded low points, and photos with traits assigned to be quality representations are awarded high points. 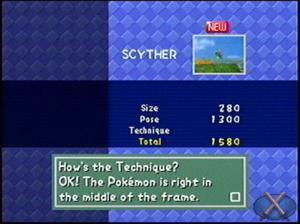 Players are not informed of these criteria before taking photos for the first time—they are only instructed to “take a lot of photos” and to “Press A to shoot” (Pokémon Snap). They are also not informed that only a single shot of each Pokémon type is eligible for judgement per trip. Only through attempting to snap too many photos do players find they are limited to 60 exposures per trip, and only through attempting to select multiple snapshots of a single subject do players realize they can only bring one to the expert for critique. Each photo is judged on a few main qualities: size of subject, pose of subject, and technique of the shot. Additional bonuses are added to the score if there are multiple subjects in the photo, or if the player has performed certain events on a course that lead to special or unique poses (for example, getting a Pokémon to stand on a surfboard or sing in a group). The game privileges shots in which the subject’s size takes up about a third of the frame, the subject is in the centre of the frame, and is facing the camera. Some poses are encouraged over others, such as dancing with or attacking other Pokémon, but for the most part, all that is emphasized is that the Pokémon should not be facing away from the camera. The player is taught these specifics through the feedback sessions, in which the Pokémon expert makes comments such as “This shot would have been perfect if the Pokémon were in the middle of the frame,” “How’s the size? It’s so-so,” “It disappoints Pokémon to be photographed from behind,” “You were close [to beating your old score],” or “All right! [This photograph is] very nice!” (Pokémon Snap). Each comment is prompted from a particular point range. For example, a perfect score in a category is 1,000 points, whereas a score of 350 or below is considered a poor attempt. The player learns which traits are desirable through this feedback and begins to incorporate those requests into his or her gameplay style. This teaches players to take a particular kind of photo—a very simple, straight-forward photo in which the subject of the photo has been posed in a desirable manner in the middle of the photo. This means that the player has very little creative input and is not encouraged to explore creative or personal style. The fact that Snap gamifies basic photography skills and teaches its players how to create a single kind of photographic image indicates a single acceptable or desirable kind of photography. Not only does it teach just one style, but it also discourages learning others in the game space. This can be viewed as a kind of photographic colonialism—the limitation to a single viewpoint at the expense and extinction of others by a controlling power outside of the immediate environment. Snap disallows a variety of voices within its gameplay and photographic requirements, separating itself from photographic arts, which seeks to “find new voices, explore new ways of making art, and also includes a large number of people dedicated to education, criticism and preservation” (Sandor and Fron). Instead, Snap prefers its players to produce particular kinds of photos in a particular way. There is an easily-made analogy between the reckless photographic practices of Snap and tourist photography in general. This idea, wherein a temporary resident takes away part of a place for his or her own purposes, acts to reminds us that “much tourist photography is about ‘consuming’ significant places” (Larson 25). This consumption comes at the price of place itself. 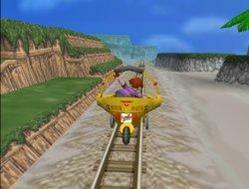 As the player rolls through various habitats in Snap, safe in the cart, he or she is encouraged by the game’s mechanics to throw objects at their photographic subjects—either apples, which on one hand are desired food items by the Pokémon but can also cause harm when hit repeatedly with them, or an item called a “Pesterball,” which contains a misty purple gas that stuns or knocks Pokémon unconscious. The game does not discourage players for manipulating the environment in any of these manners: in fact, an 800 point bonus is applied to a photograph taken of an unconscious Pokémon. An unconscious creature is, after all, easier to get near and to pose. This lack of concern for the subjects of these photos (and the subject of these abuses) brings attention to the inherent power dynamics this meta-realistic Snap portrays. Players find themselves “gazing on other people’s reality with curiosity, with detachment, with professionalism, the ubiquitous photographer operates as if that activity transcends class interests, as if its perspective is universal” (Sontag 55). The player’s goals of consuming the space and mastering his or her collection are the only perspectives that matter in the game. 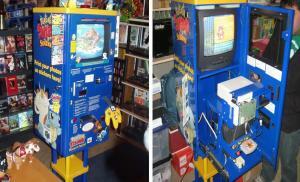 The mastery elements encouraged by Snap and Pokémania in general were amplified when Nintendo introduced real-world printing booths for the in-game photographs. According to Bogost, snapshots are the smallest most intimate modes of expression (73). Snap’s printed snapshots can be considered a way to combat the private nature of traditional snapshots while at the same time encouraging competition and mastery. Because everyone playing the game has a similar experience and players understand they are given the same photographic subjects, sharing the photos is a kind of proving ground in and of itself. 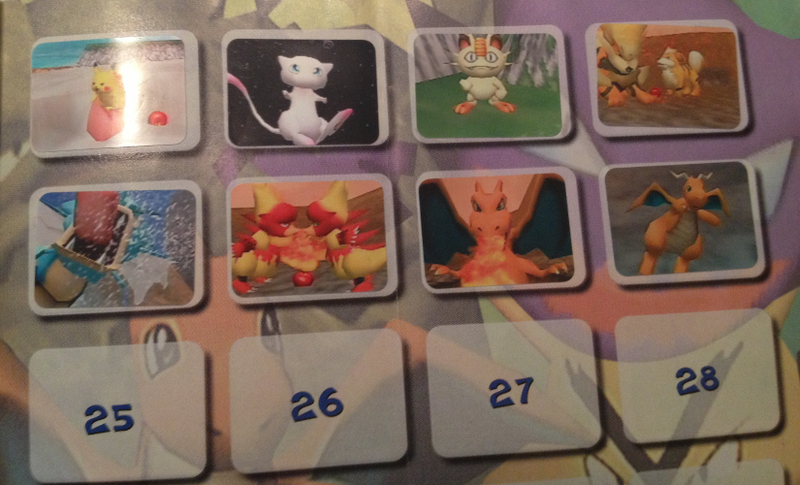 There are 63 Pokémon in the game and players must photograph them all to win. So each player’s snapshots are both communal and private, capturing moments established and shared by all. At the same time, this does not make them any less intimate because only players of the game would have the knowledge base required to see the mastery elements these photos represented; while snapshots tend to be personal, the specialization required to take these photos was not limited to a single individual, creating a sense of community where there previously was not. Sontag compares photography and collector-culture, noting “like the collector, the photographer is animated by a passion that, even when it appears to be for the present, is linked to a sense of the past” (77). When the collector is also a photographer, and vice-versa, the relationship becomes considerably more about collecting a past in order to present it to others. These snapshots, when digital only, are difficult to use as evidence of mastery. Snap is not a multi-player or online game, so players couldn’t compete during gameplay itself. Instead, the permanent past-tense of the snapshot was a method of proving the consumption and control of the gamespace. Poremba notes that screenshots act as “surrogate possessions” due to the fact that “they present a means of appropriation within the normally defined context of a constructed game experience” (51), meaning they are objects used to show off the time and effort put into a game: trophies. Additionally, players’ Snap results were limited to their own gaming console and cartridge, so they might have become even more private and personal, but the introduction of the Pokémon Snap stations changed this. The stations, which existed in participating Blockbuster Video stores in North America, were set up as modified Nintendo 64 stations in arcade cabinets. Players would save their Snap photos on a Nintendo 64 memory card at home and insert it into the station and be able to print 4 sets of four postage stamp-sized sticker sheets at $3 a sheet. The printing stations were a promotional tool; the printed photos acted as tangible proof that was easy to share and proliferate, if a player could get ahold of them. Since physical photographs are both objects and images (Larson 31), they also signaled that the player had the funds to print the photos, as well as consistent access to the station itself. On a larger scale, Pokémon in all its forms dominated the 90s schoolyard; children who were allowed to bring (and owned) their binders full of Pokémon cards and their Nintendo Game Boys to school were part of a small elite group; they collected more than other children, some who were not fortunate enough to have their own. To capture and collect Pokémon is to participate in consumer culture and thus show dominance over minority groups, namely children from more wealthy families over less wealthy families and adults over children as a whole. “Surrealism is a bourgeois disaffection” Sontag writes, “that its militants thought it universal is the only one of the signs that it is typically bourgeois” (54). The elitist nature of photography connects back to the early days of portrait painting and daguerreotypes, but video gaming, just like any new form of technology, is also an elitist act requiring the money, time, and physical capabilities to play. For children, this meant acquiring a level of agency through their parents while also living in an area which had game stores and Blockbuster Video stores. Is the participation of collecting and sharing Pokémon photos a way to go beyond the scope of the game and the limitations of the scoring system? Perhaps if it had been more economically and socially viable for its audience. Without the ability to print and share photos outside of the rule-based proceduralism of the game, players lose their changes to form and maintain their own criteria and judgements for their Pokémon snapshots. Without the social sharing that the physical snapshots allowed, only the game’s point system places value on the photos and stipulates how those photos ought to look. Photography enforces a particular kind of authority and encourages the appropriation of spaces. Players of Snap can certainly be seen as doing this as they explore new areas, photograph new subjects, and alter the environment around them. Players consume and dominate the spaces they enter on their quests for the ultimate collection. This quest consumes not only the digital space, but leaks into the physical as well. Snap’s in-game power relationships between subjects of photography and the player as a digital photographer encourage digital colonialist impulses, such as the intrusion into an “unclaimed” space and a disregard for the consequences of interrogating its population for personal gain. The mastery elements promoted by Pokémania were played up through the material printing stations, acting to extend the dynamics of power in collection-culture. This competition outside of the game environment prompts players to return to their private digital world, exhaust it, and tout their trophies among elite peers outside of the digital space—playful exploitation and extraction of desirable material from an under-developed area for the benefit of the digital colonist. Lastly, the gamification of photography teaches and encourages players to learn a particular set of photographic skills which privileges conformity to a specific structure established by the game. Only one kind of photo is considered acceptable, appropriate, or worthy of praise, no matter how the subjects are treated or manipulated. Deviations or explorations of the limits of this conformity are discouraged and punished through the points system. The type of mass-produced photo, although comprised of different types of Pokémon, still remains a repetitious process as opposed to the facilitation of a creative outlet. These constructions of power within the game, as well as outside of it, speak to the level of control and agency a player has in a digital world and thus, meta-realistic representations of photography as play. Barthes, Roland. Camera Lucida: Reflections on Photography. New York: Hill and Wang, 1981. 42-60. Print. Bogost, Ian. How to Do Things with Videogames. Minneapolis: U of Minnesota, 2011. Print. Larsen, Jonas, and Mette Sandbye. “The (Im)mobile Life of Digital Photographs: The Case of Tourist Photography”. Digital Snaps: The New Face of Photography. Ed. Jonas Larson and Mette Sandbye. New York: I.B. Taurus, 2013. 25-46. Print. Manovich, L. The Language of New Media. Cambridge, MA: MIT Press. 2001. Print. Pokémon Snap. HAL Laboratory and Pax Softnica. Nintendo. 1999. Nintendo 64. Poremba, Cindy. “Point and Shoot: Remediating Photography in Gamespace.” Games and Culture 2.1. 2007. 49-58. Web. Sandor, E., and J. Fron. “The Future of Video Games as an Art: On the Art of Playing with Shadows”. Playing by the Rules: The Cultural Policy Challenges of Video Games. 2001. Web.